Gift the new "Mount Hood Coloring Book" to others who love our forests. Last week we had 50 people in the forest planting trees--just the right thing to do as we face a bleak political transition. Since then, we've heard from many of you that you are ready to double-down on your commitment to protecting our beloved home. Let’s do it! Join millions of Americans on Giving Tuesday and invest in your community. Bark is setting a goal that day of raising $2,000 to protect clean water on the slopes of Mt. Hood, stop clearcuts in the Clackamas, and improve access to our favorite trails. Ready today? Donate now. 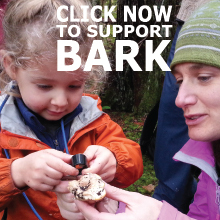 Bring your end-of-year donation to Bark. Go home with 12 copies and spread the love. We’re kicking off our Winter Fundraising Campaign with a special event on Giving Tuesday. The “Mount Hood Coloring Book,” created by Bark volunteer Esther Forbyn, will be hot off-the-press, and we need you to get these to people and places who need a little inspiration right now. Esther will have just returned from Standing Rock, building winter shelter for the water protectors. Stick around to hear stories about her time there, meet other Barkers doing great work, and enjoy a hot drink with us. I felt lucky to be part of Bark this past week, knowing that this organization is ready to face the challenges ahead. In the coming weeks, we’ll share some positive election results from the Gateway Communities of Mt. Hood, and how our local actions can have a regional and national impact. One thing we know for sure--it’s time to come together as a community. Jump start Bark's Winter Campaign with $50 right now to send a strong message that you are committed to our forests. *Thank you to Raven Summer, age 6, for the beautiful coloring in the new Mt. Hood Coloring Book!